Every homeowner wants to have a beautiful yard. They know it will increase the value of your home, improve the neighborhood and offer owners a haven for play, entertaining and relaxation. Almost all difficult yards though will offer their own set of challenges. Small yards might seem like an easier landscaping design project but they present their own challenges. With a smaller canvas even the minor details will count – some piece of the design that is incomplete or incongruous can be a noticeable eyesore. As you work through the design, consider how to make the most of the smaller stature by pulling together every corner of the yard. A typical landscaping design misstep is to compartmentalize the yard – a patio here, a bit of lawn, maybe a play area. Instead look at the big picture. Consider what the vital features are that you want to incorporate and then figure out how to make them work together. One simple trick is to place important features towards the corners of the yard to give the illusion of a larger space. You can use pathways and plant materials to pull the eye outward. For example a play area for children might be accessed by a swatch of lush lawn or a curved stone path could lead to a restful fountain in one corner. Large lots can be quite daunting. Their specific challenge is to choose elements that create a look which is balanced, cohesive and well delineated. One of the most successful ways to manage this is to create distinct outdoor rooms – cooking and dining, vegetable gardens, play area, pool, quiet retreat, butterfly garden, etc. As with a small yard, look to the corners of the yard first and determine what you want to locate there. Often the far corners are where homeowners place the larger recreational areas like a pool or play zone. If a vegetable garden is to be more practical than beautifying it might be placed in a back corner. Areas like these can be screened with trees, native grasses and shrub hedges. Next look to the perimeter of the yard: think about elements that will make a strong statement and how you can build out from there. The plant materials you choose will depend on the light and soil conditions so be sure to make those considerations in your landscaping design. Also consider activities that might take place in each section. For example you wouldn’t want a kid’s play zone next to your peaceful butterfly garden. Because large yards require a bigger financial investment think about filing in your “rooms” on a gradual basis. A lush lawn down the center of the space will always look lovely as you build up areas around it. Consider retaining walls to create a terraced space that will add visual interest. Think about ground cover where grass is difficult to grow; shrubs and background plants will add interesting dimension. Use tall grasses to soften any walls or fence lines. Add tiered plant materials that include tall trees toward the back, shrubs and ornamental grasses in the middle, and flowers and smaller shrubs in the front. Look to colorful accent trees to break up the shades of green. 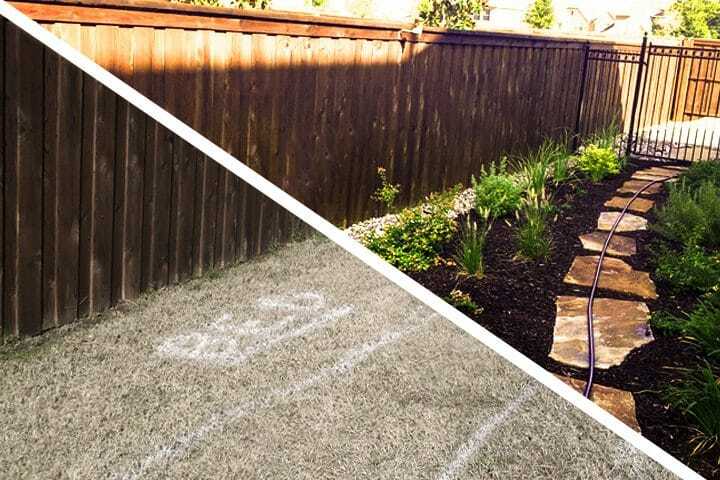 Many of the biggest landscaping design challenges come with sloped yards. You have to think about water run-off and soil erosion on top of all other considerations. If you’re not sure where to start, work with a landscape architect who can guide you through the planning and even implementation. These professionals will have the experience necessary to identify best plant materials and the safest way to work with the slope. Frequently the first thought is to level out the slope but in doing so you could compromise the ground stability. Instead look to adding terraced retaining walls. These levels will offer terrific opportunity for showcasing beautiful plantings and the walls themselves will create a striking design perspective. A design pro will recommend materials appropriate for wall construction and there are many terrific options to choose from – natural stones, interlocking brick, weathered wood and even poured concrete. A proper landscaping design will not only add beauty to your property but ensure that structures are sound and proper drainage is in place. Don’t let these landscaping design challenges for difficult yards damper your creativity. With a little research and a bit of work your imagination will find ways to use the space to your advantage and your efforts will reward you for years to come.